Alexander McQueen’s team showed his final designs last night in Paris. In my opinion, McQueen was really coming to the apex of his designs. Although, I haven’t been in fashion long, I know when something strikes a cord in my heart. When I reviewed the images from this line I was in awe. The artistry is breathtaking. 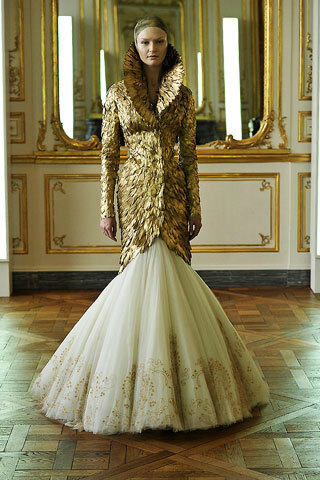 It is said that McQueen totally abandoned the Internet and electronic media in order to find his inspiration. Where is Spring 2010 line was all about women transforming into reptilian-like fashion creatures, the Fall view is all about classic romance, heavy adornment, and rich colors. He took heavily from the Barouque perios of classic art. The team showed 18 looks. 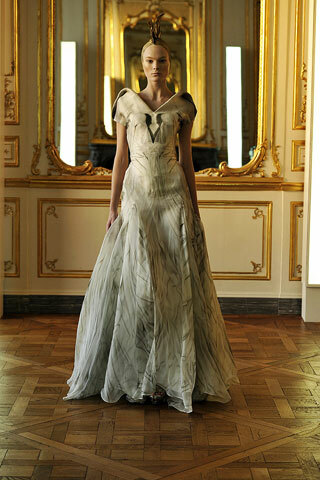 McQueen was not done at the time of his death and the looks that were shown were about 80% complete. It’s so sad that a designer of his caliber has been taken away. I continue to pray for his family, friends, and staff. He will be missed. I pulled some of my favorite pieces (shown below). You can view the rest of the collection HERE. Previous postMusic: T.I.’s new song – "I’m Back"